The Art House Project was a project for the personal home of Houston home builders L&B Limited. Their home was to be featured on the Houston Heights Home Tour - Spring 2018 and they needed to update their space. 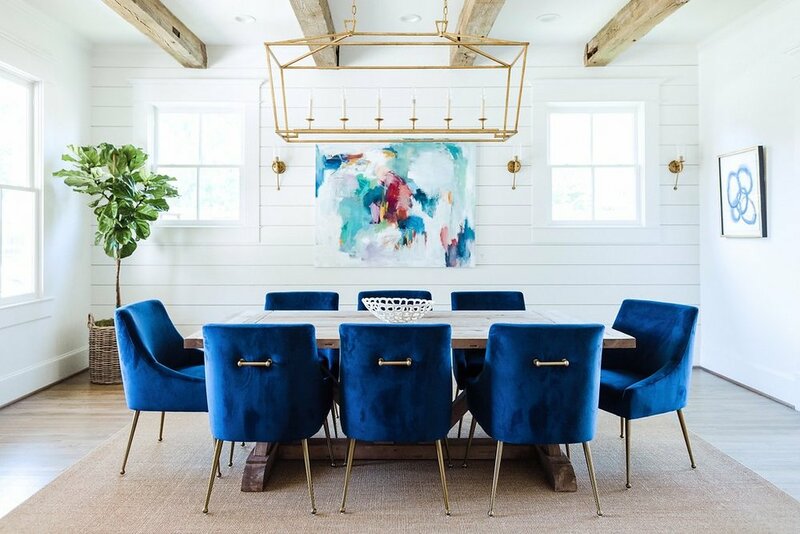 The project included a full furniture overhaul of the living and dining room, accents to the kitchen, and some other touches in other rooms throughout the home. Their beautiful craftsmanship provided the prefect canvas to work with. For the tour, we asked local artist, Kellie Morley, to display her art throughout the home, which provided the perfect accents to the space. The homeowners ended up purchasing the piece custom done for the living room, and we love it! The Taylorcrest Project was a fun kitchen remodel for a client in Memorial. Their original kitchen was narrow and dark and it did not allow for entertaining. We opened up the wall into the dining room (opposite the island chairs) and added the island in the center. We also added a huge window to increase the natural light in the space. The unique feature of the range on the window allowed for much more light to flood the space and ensured that the husband (aka chef of the family) had a great view at all times of their backyard. The bar area sits on one side of the opening to the dining room. Here, we changed the tile pattern, but stayed in the same color scheme and took the tile all the way up the back of the cabinets to set it apart from the rest of the kitchen. All images and content are property of Katie Davis Design and may not be used or reproduced without permission.